I then developed a more limited codebook using the most frequent/significant codes and proceeded to compare different events with the same code (looking up relevant edits of the article in order to get the full story), and to look for tacit assumptions that the actions left out. I did all of this coding in Evernote because it seemed the easiest (and cheapest) way of importing large amounts of textual and multimedia data from the web, but it wasn’t ideal because talk pages, when imported, need to be re-formatted and I ended up using a single column to code data in the first column since putting each conversation on the talk page in a cell would be too time-consuming. I then moved to writing a series of thematic notes on what I was seeing, trying to understand, through writing, what the common actions might mean. I finally moved to the report writing, bringing together what I believed were the most salient themes into a description and analysis of what was happening according to the two key questions that the study was trying to ask i.e. How do Wikipedia editors, working together, often geographically distributed and far from where an event is taking place, piece together what is happening on the ground and then present it in a reliable way? And: how could this process be improved? Ethnographymatters has a great post by Tricia Wang that talks about how ethnographers contribute (often invisible) value to organizations by showing what shouldn’t be built, rather than necessarily improving a product that already has a host of assumptions built into it. 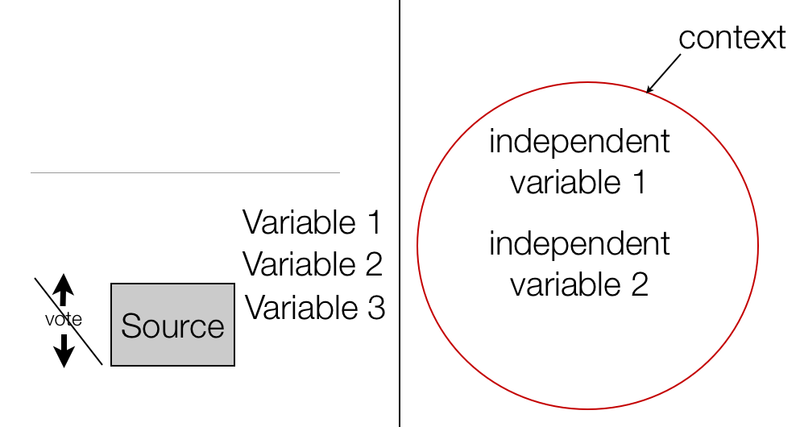 And so it was with this research project that I realized early on that a ranking system conceptualized this way would be inappropriate – for the single reason that along with characteristics for determining whether a source is accurate or not (such as whether the author has a history of presenting accurate news article), there are a number of important variables that are independent of the source itself. On Wikipedia, these include variables such as the number of secondary sources in the article (Wikipedia policy calls for editors to use a majority of secondary sources), whether the article is based on a breaking news story (in which case the majority of sources might have to be primary, eyewitness sources), or whether the source is notable in the context of the article (misinformation can also be relevant if it is widely reported and significant to the course of events as Judith Miller’s NYT stories were for the Iraq War). This means that you could have an algorithm for determining how accurate the source has been in the past, but whether you make use of the source or not depends on factors relevant to the context of the article that have little to do with the reliability of the source itself. Another key finding recommending against source ranking is that Wikipedia’s authority originates from its requirement that each potentially disputed phrase is backed up by reliable sources that can be checked by readers, whereas source ranking necessarily requires that the calculation be invisible in order to prevent gaming. It is already a source of potential weakness that Wikipedia citations are not the original source of information (since editors often choose citations that will be deemed more acceptable to other editors) so further hiding how sources are chosen would disrupt this important value. On the other hand, having editors provide a rationale behind the choice of particular sources, as well as showing the variety of sources rather than those chosen because of loading time constraints may be useful – especially since these discussions do often take place on talk pages but are practically invisible because they are difficult to find. f) editing disputing the way that editors reflected information from various sources and replacing primary sources with secondary sources over time. It was important to discover the work process that editors were following because any tool that assisted with source management would have to accord as closely as possible with the way that editors like to do things on Wikipedia. Since the process is managed by volunteers and since volunteers decide which tools to use, this becomes really critical to the acceptance of new tools. 1. The first would be to for designers to experiment with exposing variables that are important for determining the relevance and reliability of individual sources as well as the reliability of the article as a whole. 2. The second would be to provide a trail of documentation by replicating the work process that editors follow (somewhat haphazardly at the moment) so that each source is provided with an independent space for exposition and verification, and so that editors can collect breaking news sources collectively. Regarding a ranking system for sources, I’d argue that a descriptive repository of major media sources from different countries would be incredibly beneficial but that a system for determining which sources are ranked highest according to usage would yield really limited results (we know, for example, that the BBC is the most used source on Wikipedia by a high margin, but that doesn’t necessarily help editors in choosing a source for a breaking news story). Exposing the variables used to determine relevancy (rather than adding them up in invisible amounts to come up with a magical number) and showing the progression of sources over time offers some opportunities for innovation. But this requires developers to think out of the box in terms of what sources (beyond static texts) look like, where such sources and expertise are located and how trust is garnered in the age of Twitter. The full report provides details of the recommendations and the findings and is available on Scribd here. This is my first comprehensive ethnographic project and one of the things I’ve noticed having done other design and research projects using different methodologies is that, although the process can seem painstaking and it can prove difficult to articulate the hundreds of small noticings into findings that are actionable and meaningful to designers, getting close to the lived experience of editors is extremely important and valuable work that is rare in Wikipedia research. I realize now how before I actually studied an article in detail, I knew very little about how Wikipedia works in practice. And this is only the beginning!